We are supporting Operation Santacop, unwrapped toys will be accepted for needy families in our community. Please join us in the spirit of giving! Been a while since our last operations post, but that hasn't meant we have slowed down any. Since our last update, members have responded to 2 in town structure fires and several out of town structure fires. Also, a car fire and many other incidents. This year is shaping up to be one of the busiest years with more fire than we have seen in several years. Fortunately, those slower years and our down time this year have been filled with training. This is helping to ensure that when we do arrive at these incidents we are ready to quickly and efficiently do our jobs, with 100% volunteer staffing. 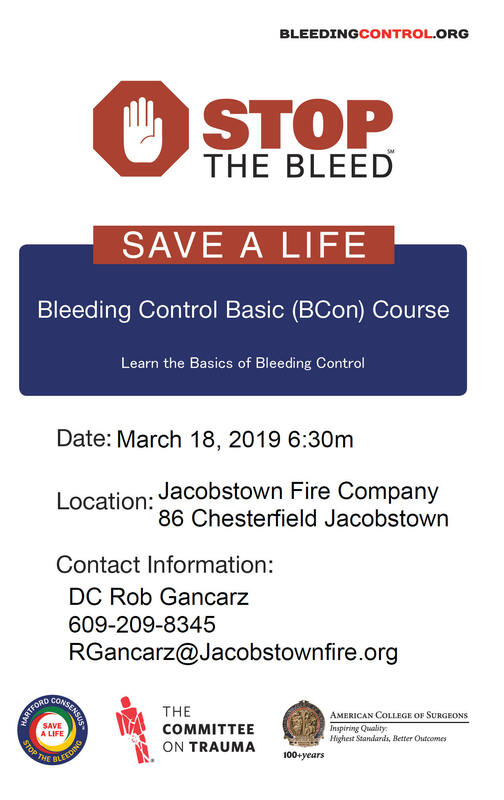 If you have interest in becoming one of North Hanover's bravest, and join the Jacobstown Fire Company contact us on Facebook or visit the station. Don't forget this weekend is our fire prevention open house. 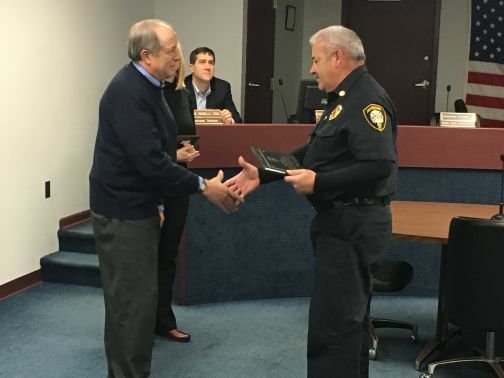 Jacobstown Volunteer Fire Chief Benjamin Palombi presented plaques to Mayor Durr and Deputy Mayor Butler, at their last Township Committee meeting, for serving the residents of North Hanover Township. Chief Palombi noted the exceptional support shown to the JFVC over the years. 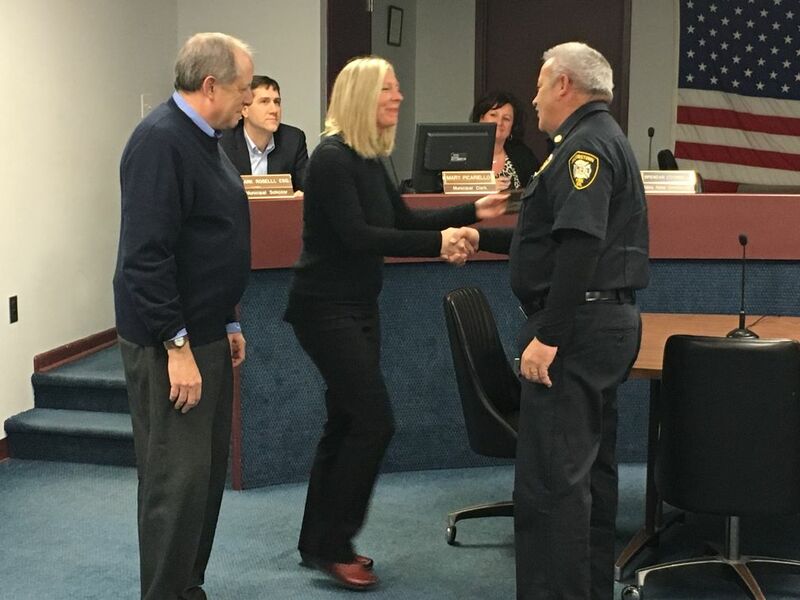 Best of Luck in your future endeavors Mayor Durr and Deputy Mayor Butler. 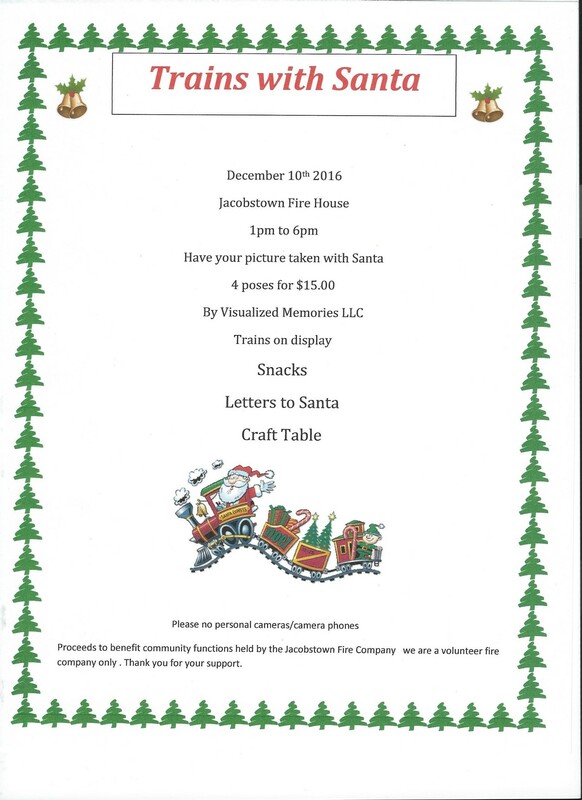 The Jacobstown Fire Company is hosting "Trains with Santa" on December 10. Jacobstown EMS and Fire Open House on May 21, 2016 from 9 am to 1 pm at the Jacobstown Fire House. Less than 1% of the population of the United States are firefighters. Do you have what it takes to be one. Apply today or at the Open House May 21st. 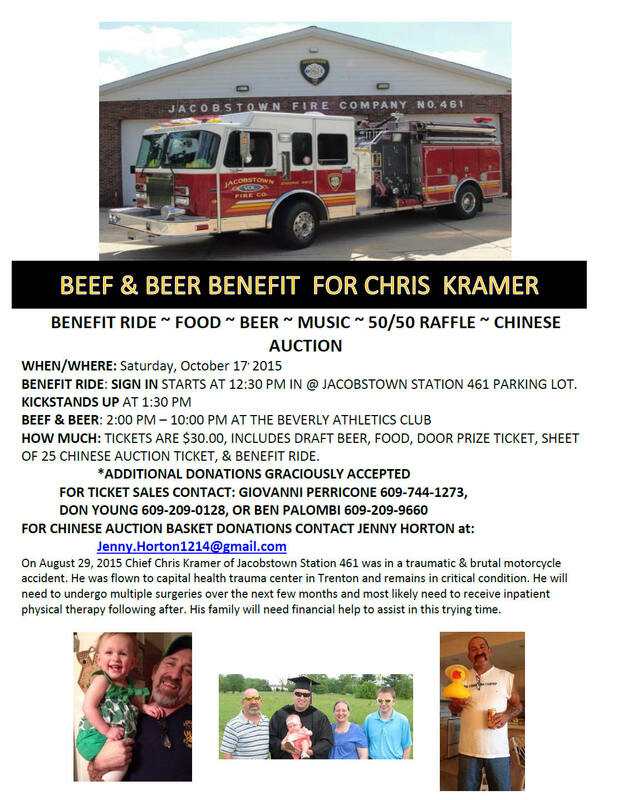 at the Jacobstown Firehouse Friday March 25th 12:00 till 6:00, and Saturday March 26st, 9:00 till 3:00, please come out to support the fire department. Proceeds are used to help Jacobstown Volunteer Fire Company and the Community. 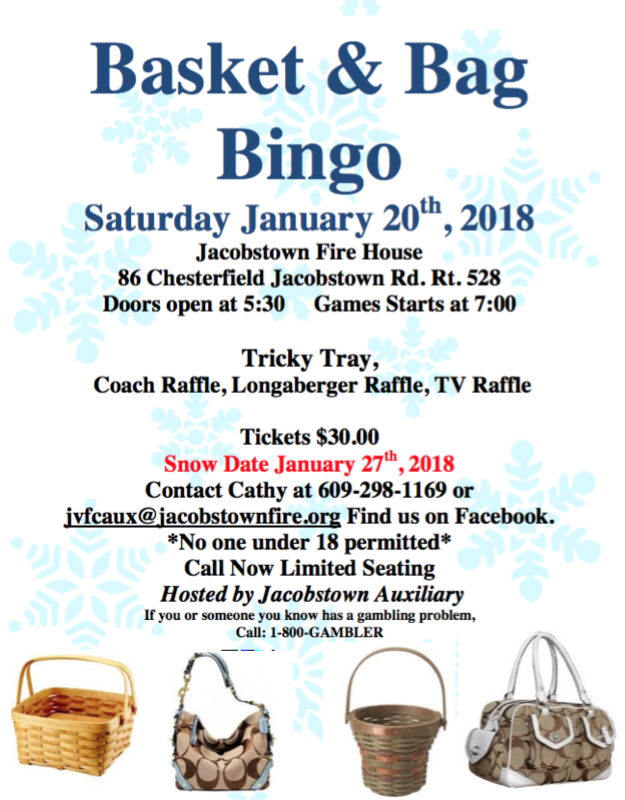 The Jacobstown Volunteer Fire Co. Auxiliary Basket & Bag Bingo originally scheduled for January 23, 2016 was held on January 30, 2016 because of the snow storm. In the event of emergency power or water failures the firehouse can be used for supply water or power charges. Stop by, with the impending storm we plan on staffing the station with VOLUNTEERS for the duration. We at the Jacobstown Fire Company would like to thank all our supporters, the residents and patrons of North Hanover Township. To date we have had 174 fire calls and 696 EMS calls. It is and always will be our pleasure to provide fire and EMS services to our community. We look forward to 2016 and providing more community outreach and education. Please continue to follow us here. Have a safe and happy new year and if you drink please don't drive. PS. If you have any interest in becoming a member this year. Don't hesitate, ask today! Hello great folks of North Hanover. 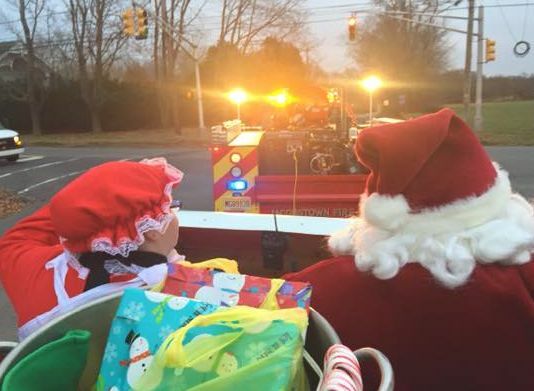 It is that time of year again and Santa Claus has just called the Jacobstown fire chief personally to let us know when he will making an appearance in our great town. 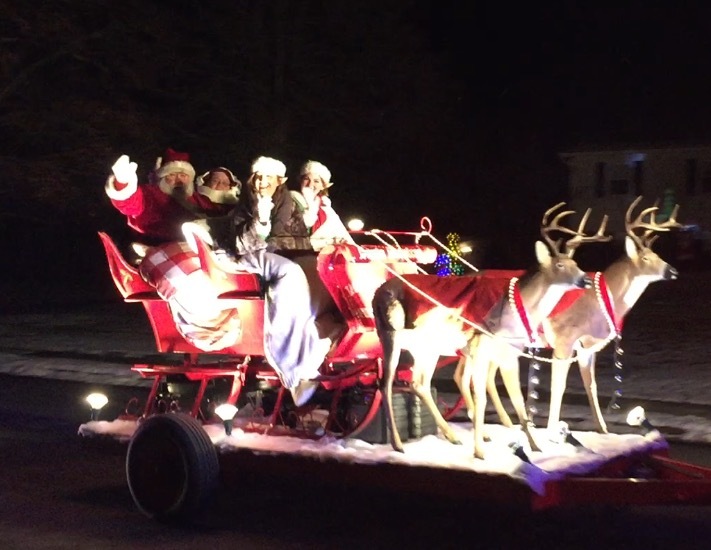 Santa will make an early visit Friday Dec. 4th - 7 pm at the North Hanover Twp Municipal Building on Schoolhouse Rd. 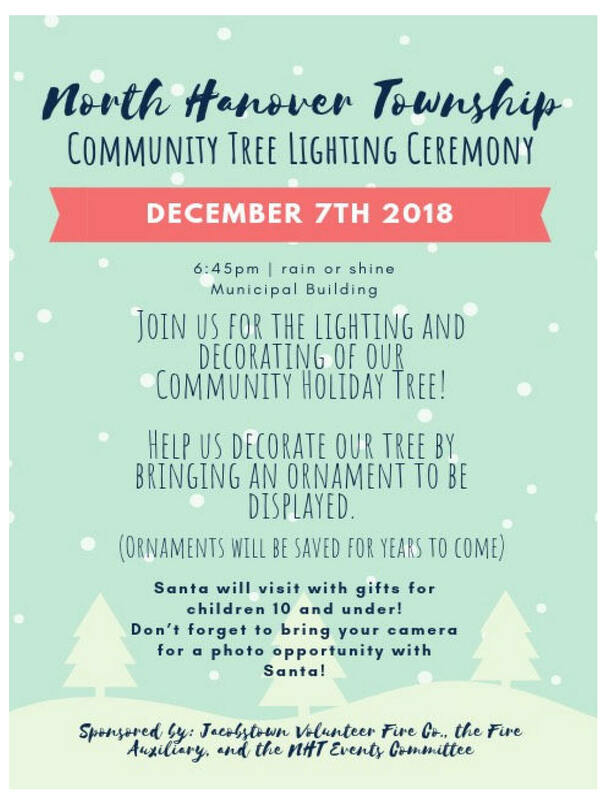 to help us with our Annual Tree Lighting and to have a meet and greet with all of the local boys and girls. request due to the lights and sirens please call the JVFC @ 609-758-8177 and leave a voicemail or email at Jacobstownfirecompany@jacobstownfire.org . 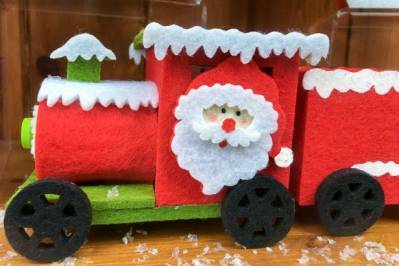 Mr. & Mrs. Claus and the members of the Jvfc are looking forward to seeing all of you soon. Merry Christmas & Happy Holidays. Make sure you water your tree. Teach your Children the Right Thing To Do. What Would a Child Do in a House Fire? 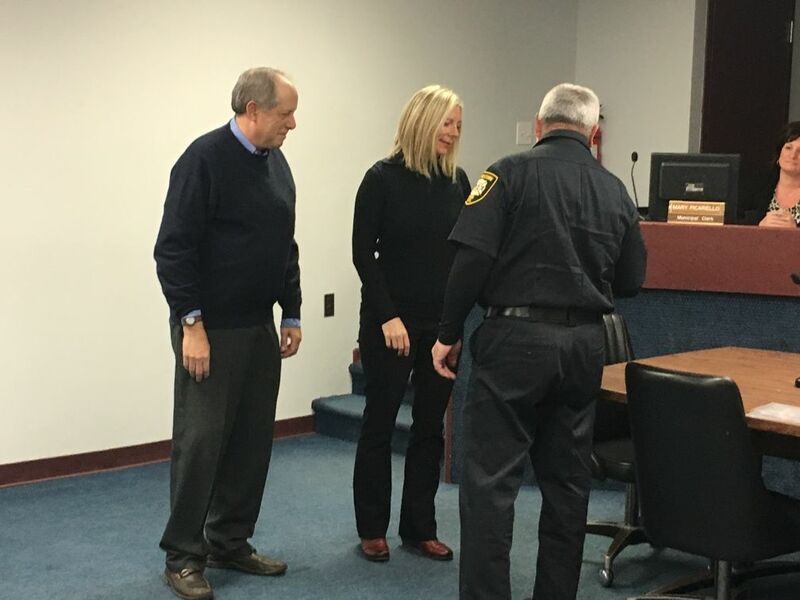 Virtua of Burlington County officials launch PulsePoint app, Nov. 20, 2015. This weekend Jacobstown Fire Company and Cookstown Fire Company had a joint training session learning about how to evacuate horses from a burning building. We understand that horses are a huge investment for their owners as well as a member of the family. We invested our time in this training to ensure we provide the best service to our two and four legged citizens. Additionally, happy birthday to the United States Marine Corps. And thank you Veterans for your service. As summer fades away and temperatures begin to cool, we begin to transition from running air conditioners to heaters, furnaces, and fireplaces. Jacobstown Fire Company would like to remind everyone to operate these heating units for the first time, during daylight hours and while someone is home to watch. Many malfunctions happen within the first few times of use after being dormant for the warmer months. Heater malfunctions can be misfires, cracked internal parts, or clogged chimneys. Any of these malfunctions can lead to Carbon Monoxide buildup or Fire. Additionally check and test all carbon monoxide detectors and smoke detectors before using heating equipment. When in doubt call a certified repairman or inspector to assist in restarting heating systems. If any alarm sounds call, as both fire or Carbon Monoxide are deadly. With hurricane Joaquin predicted to hit the New Jersey area Jacobstown Fire Company, North Hanover Police Department and North Hanover Office of Emergency Management was watching the predictions closely and prepared to take action. We were able to breath a sigh of relief when the predictions showed that the storm was turning. Don't forget that the Atlantic Hurricane season does not end until November. Then we are pushed into cold weather events. Those who have them keep those generators handy and ready for more the winter weather to arrive. For more information on severe weather preparedness or safe operation of heating or electricity systems, contact us via our facebook page or company email. Special congratulations to our Fire Lieutenant and Chief Petty Officer Edward Lubas on his recent retirement from the United States Navy. 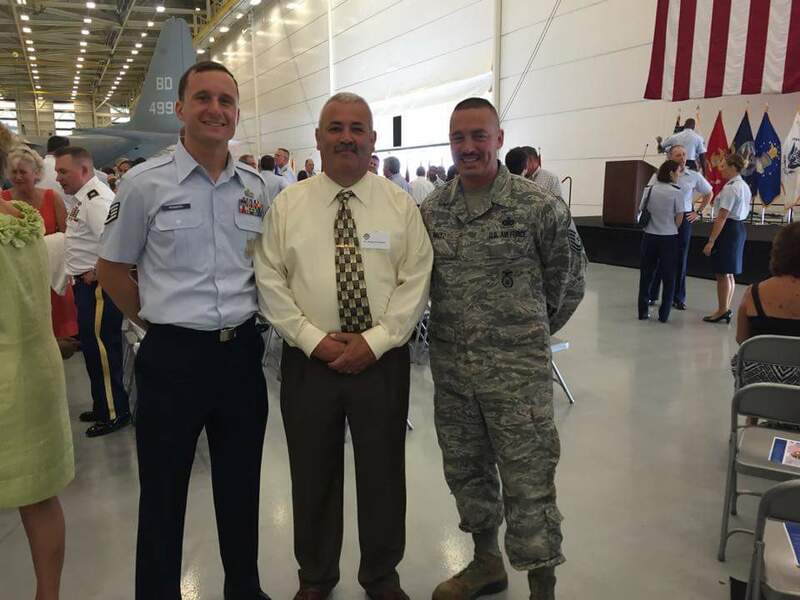 After 24 years of dedicated service we say thank you for serving our country and our community. 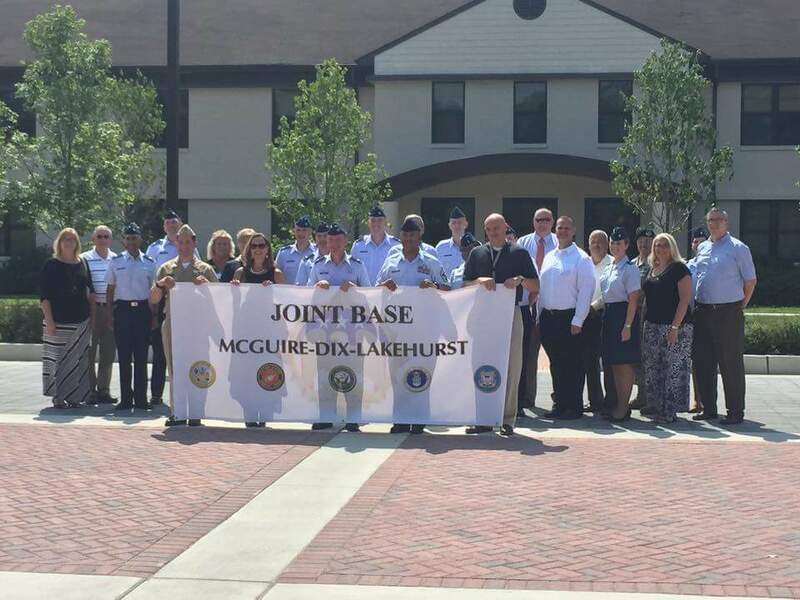 Congratulations to North Hanover Fire Chief Benjamin Palombi who was sworn in on August 19 as Honorary Commander of the Joint Base Mcguire-Dix-Lakehurst. As summer heats up weather can become rather unpredictable. This was evident in the severe storms that struck the southern area of Burlington County. Jacobstown Fire Company was called to assist in the response to these emergencies. As our area is still rural, power outages and other severe weather emergencies are a common occurrence for many of our residents. Be sure to check out our preparedness section and FEMA's website for tips for preparing for these events. Be sure to monitor our Facebook page for updates and news. Summer is also a great time to start your volunteer career with our department. Training is provided and college credits are available. 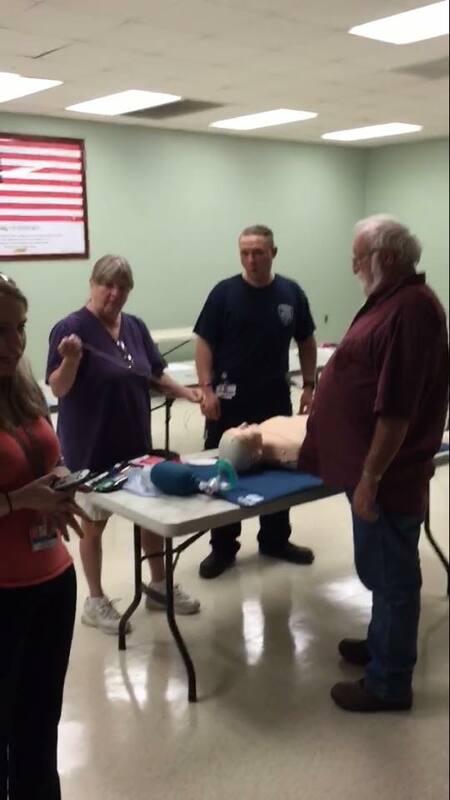 Members of Jacobstown Fire Company and North Hanover Police Department training together to recertify in CPR. Training together ensures that we work together flawlessly during an emergency. This provides the high level of service. CPR classes will be open to the public in the future so check back here and our Facebook page for details. In the early morning hours of Saturday Jacobstown Fire Co. was called to assist New Egypt fire company with a car on fire on a garage. Crews arrived and went right to work assisting with fire suppression and overhaul. Just before being released a motor vehicle incident occurred at the intersection of Meany Rd and Rt 537. The fire crew advised command and was released from the fire. In all a busy night for our volunteers. As always, be safe and join today. Jacobstown Fire Company hosted our annual Memorial Day luncheon following our township parade, we also partook in New Egypts Memorial Day parade. Turnout was better than expected and community members left with full stomachs. As summer continues to heat up, many of us enjoy the outdoors. Below are a few tips to remember to have an enjoyable and safe summer. 1. Remember to drink plenty of fluids, especially if working outdoors. 2. Use sunblock to protect yourself from harmful rays of the sun. 3. Be sure to wear life jackets when enjoying the various waterways of NJ. 4. 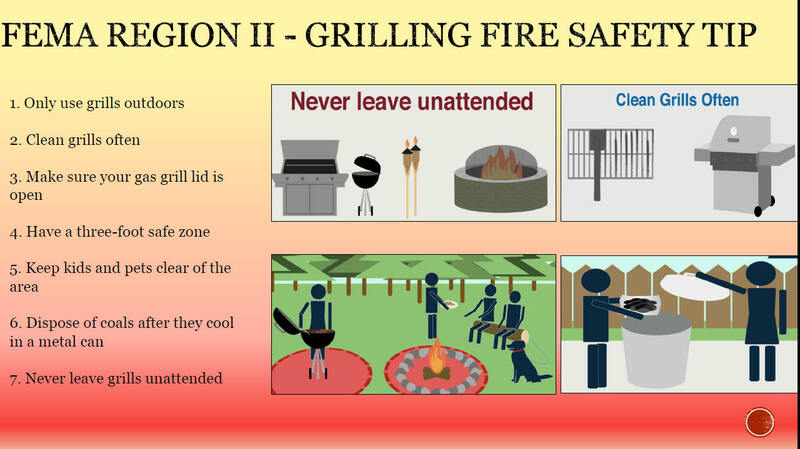 Check outdoor grills and clean thoroughly prior to using to reduce fire risk. 5. Clean yard power equipment before and after each use. 6. If having a recreational fire, be sure to clear the area around it prior to lighting the fire. 7. Clear dead vegetation from around your home and sheds to reduce fire risk. 8. Discard of smoking materials properly. 9. If you have severe allergies, carry an epi-pen. 10. Always wear your seatbelt in a vehicle, even though it may be hot, it will save your life. 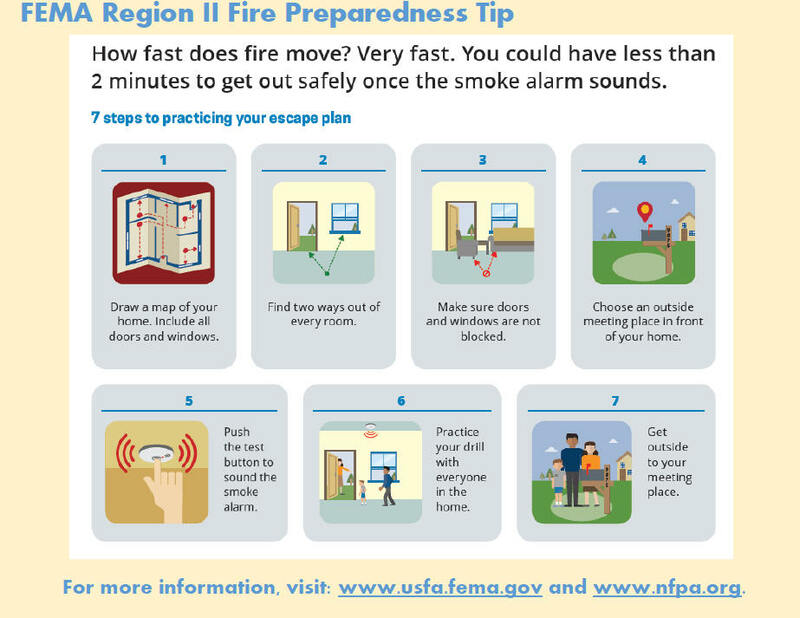 For more safety tips or to answer questions, please explore the rest of our site. As always, new members welcome, inquire at our Membership Information page. 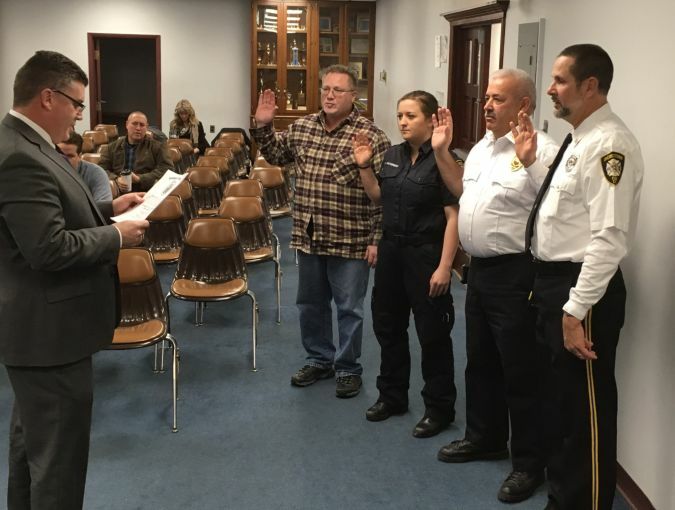 Jacobstown Fire Company has been working diligently on several projects to move forward and progress the quality of service that we provide. The building, apparatus, and equipment are maintained by volunteers. In addition to maintaining all the material items volunteers must initially train and maintain qualifications to remain a responding member. Before a firefighter can perform firefighter duties they must attend, pass, and complete over 160 hours of training. 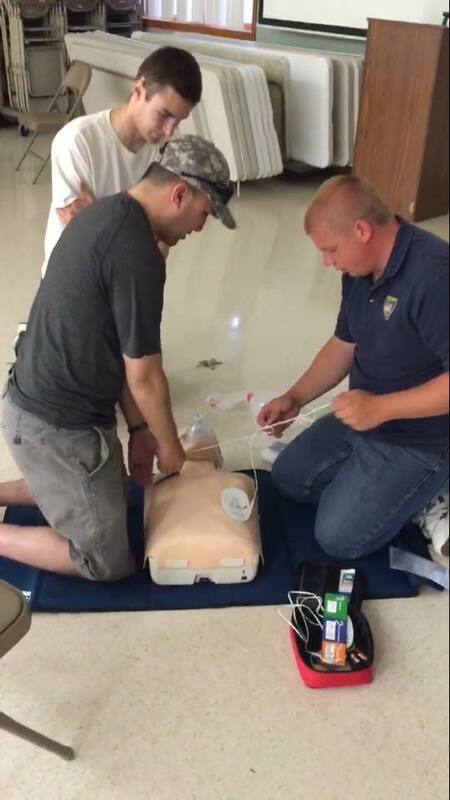 EMT's must attend, pass, and complete over 240 hours of training. As members wish to provide different services or promote within the organization even more training is required. No other volunteer position in the community requires the commitment that is required to be a firefighter or EMT, but none are as rewarding. All this training and commitment for what you might ask? To wake at 2 AM for the sick person, to be late for work for the false alarm, or holiday meals to be interrupted due to a burnt turkey. The answer is YES!! ABSOLUTELY!! Put yourself in the shoes of someone who had to dial 9-1-1, wondering how long it will take to get help to a loved one or to save their home. The choice to volunteer with emergency services is challenging, but you will receive as much as you put into the service and yourself. We challenge anyone within our community who thinks they "Have What It Takes" to check out our membership section and inquire about becoming a member. We have openings for anyone who is willing to join, including non-responding membership. 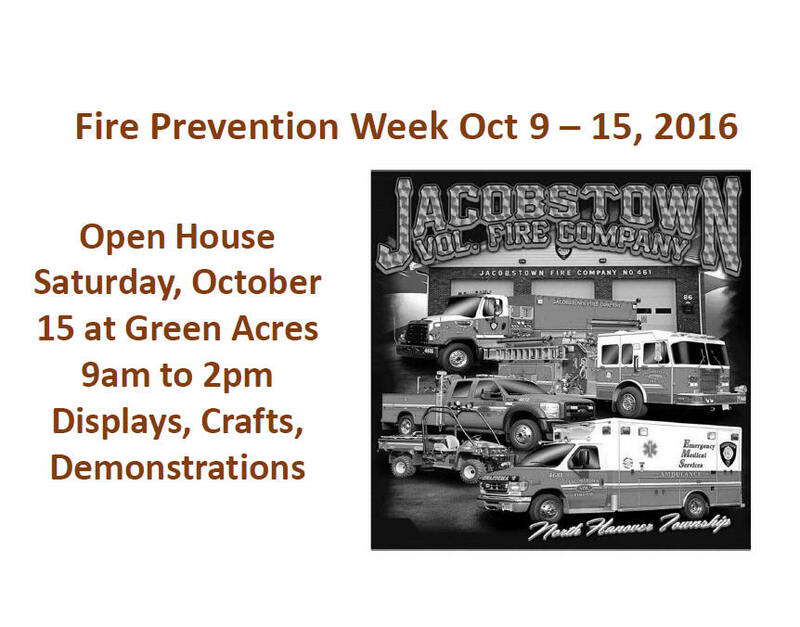 The Jacobstown Fire Company is a small rural Fire Department in Burlington County. We are 100% Volunteer. We try to do our best to fund raise but we are hampered by our lack of parking and the bad shape of our parking lot. We depend on donations for a lot of our operation. Our town supports us but they are limited also being a small community. We are hoping to use this site to help us raise money to reconstruct our parking lot. Our current lot is in very bad shape and is mud or dirt in spots and is not very appealing from the road. We are grateful for any help that we can get so that we can get our parking lot fixed and better serve our citizens. Link to donate: click here. 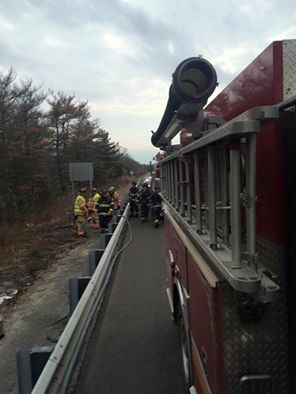 In the early morning hours of 2/13/15, Jacobstown Fire Company was dispatched to a reported dwelling fire. Residents were awoken by the sound of smoke detectors alarming, when residents went to investigate they were met with smoke conditions. Fire crews arrived and discovered the smoke to be caused by a heater backfire. While this seems minor, but the take away is to have working smoke detectors. The difference between a tragic ending and a happy ending could be the cost of a few batteries. If you need help or information on smoke detectors contact us by email at jacobstownfirecompany@jacobstownfire.org. 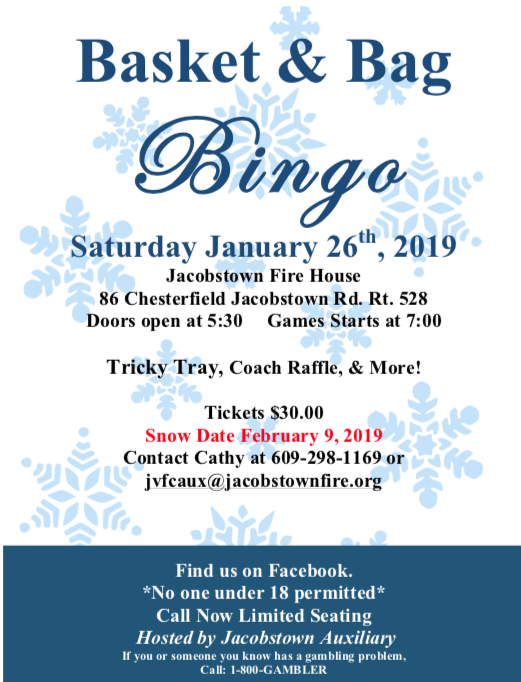 Jacobstown Volunteer Fire Company Auxiliary hosted Basket and Bag Bingo on January 31, 2015 at the Firehouse. For more information, click here.